A canoe that represents strength over adversity is about to go on show at the International Slavery Museum in Liverpool. Their Spirits exhibiting from 31 January to 7 September 2014, is a powerful installation by acclaimed Jamaican artist Laura Facey. 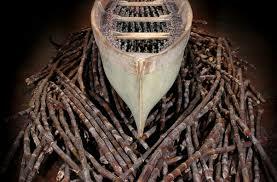 This traditional Jamaican canoe is almost five meters long and contains 1,357 resin figures that represent enslaved Africans who were transported to the country. The canoe may conjure images of Antony Gormley’s clay figures or the Chinese Terracotta Army. Visitors will see Their Spirits as a comment on the trade of enslaved Africans. But it also signifies strength and unity - the canoe had their bodies for a little while but their spirits had already gone before them. Laura Facey says in one moment the viewer of Their Spirits can experience the history and memory of slavery. Ms Facey argues that the installation is not just about ropes, chains or torture but that it communicates transcendence, reverence, strength and unity. The International Slavery Museum opened in August 2007. It is situated on the third floor of the Merseyside Maritime Museum at the Albert Dock. It is the only national museum in the world to cover transatlantic slavery and its legacies as well as contemporary forms of slavery and enslavement. It is also an international hub for resources on human rights issues and campaigning. Dr Richard Benjamin, Head of the International Slavery Museum points out the museum is absolutely thrilled to be able to bring this stunning and iconic work to Liverpool. Laura Facey was born in Jamaica in 1954. She has won several awards for her installations and sculpture. She works with cedar, mahogany and lignum vitae found high in the hills of Kingston, Jamaica where she lives. Ms Facey is best known for her 2003 work the Redemption Song - a monument to the emancipation which stands at the ceremonial entrance to the Emancipation Park in Kingston. As well as the canoe installation, Their Spirits will also contain a number of other artworks by Laura Facey. This will include nine prints and other sculptures. Their Spirits exhibition will be located on the ground floor of the Merseyside Maritime Museum.